James Stobie's 1783 map of Borenich shows an "old castle", not too far from Grennich farm. 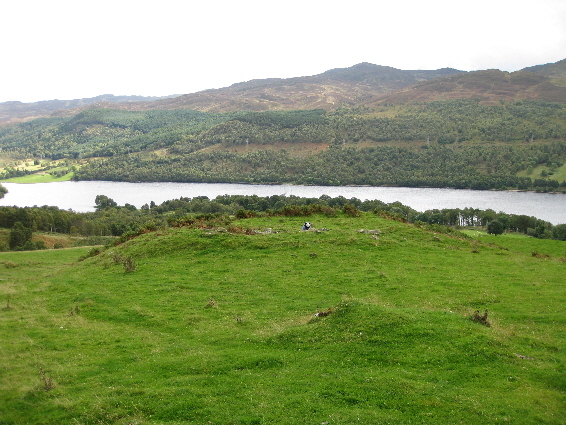 This is just one of several 'ring-forts' in the Strathtummel area, and early writers thought that these structures were Druid temples or Fingalian castles. Within less than half a mile of Port-an-eilein is Grenich i.e. Grian-fhuich or Grian-acha, the Field of the Sun. 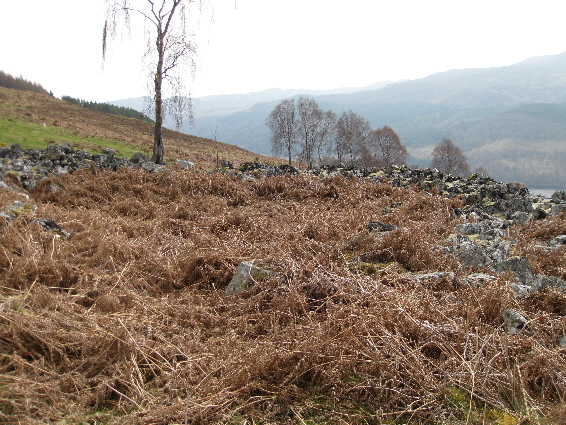 Here are the remains of a very extensive Druidical work: a large circular wall, either a castle, or the foundation of a very large cairn, with small cairns innumerable, on the barren ground above it, which were probably graves. When Professor William Watson excavated the ruins at Borenich in the early 1900s, he called them 'ring-forts' thinking that they might have been defensive 'castles', built to control movement through the Highland passes. Although many of these so-called 'ring-forts' occupy conspicuous positions, it is generally accepted that these are the remains of early homesteads dating from 200 B.C. with some in use until 1000 A.D. 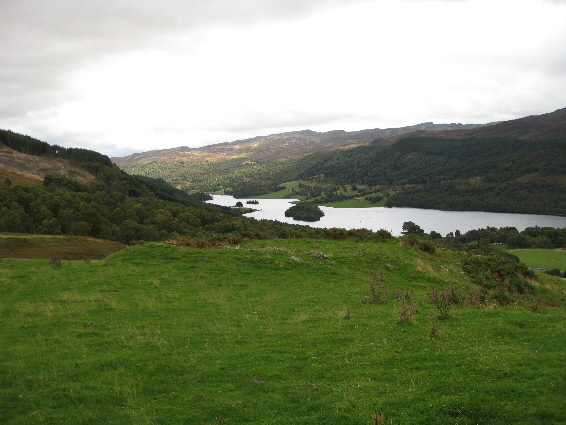 There are at least seven 'ring-forts' on the north side of Loch Tummel, with more on the south side of the loch and in the adjacent Glen Fincastle. The largest, best preserved, and most accessible is close to the Allean Forest car-park, a short distance from the Queen's View. Although the place has been mercilessly quarried, the huge stones that remain, especially on the north side, form a striking sight, and give a strong idea of the power and solidity of the original structure. Within the enclosure wall there were traces of a number of post-holes and a hearth: features similar to other sites such as Litigan. 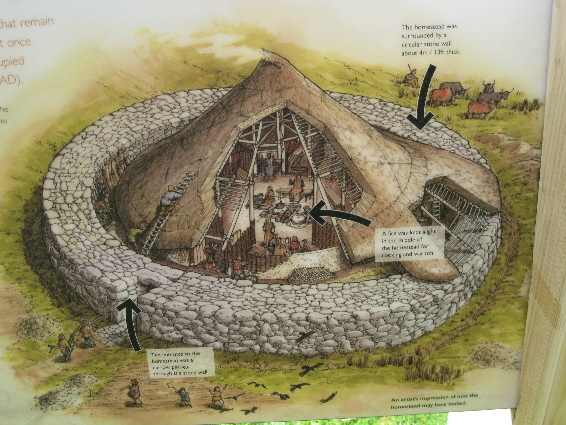 This suggests that the substantial walls were not defensive, but surrounded a large internal timber-built roundhouse, and that the enclosure was, at least, partially roofed. The entrance to the homestead was on the western side, which seems to have been a characteristic feature of homesteads in the local area. There has been some debate as to the significance of this fact, but the siting of this opening could merely be a practical measure: allowing the pervailing wind to provide an adequate draught for the central hearth. The entrance, itself, is paved and evidence of post-holes in this area suggests that there might have been some sort of structure. Very few artifacts were founds: a stone cup; a yellow translucent bead, a stone lamp and two rotary querns for grinding flour. There was evidence that the Queen's View site had been used for iron-working, but any iron artifacts probably would not have survived in the highly acidic soil. Considering the noxious fumes produced during 'bloomery' iron-making it is most likely that this activity took place after the homestead had been abandoned as a dwelling. Moving eastwards, the next homestead (NN 8445 6012) is below the main road, about half a mile east of Borenich farm. 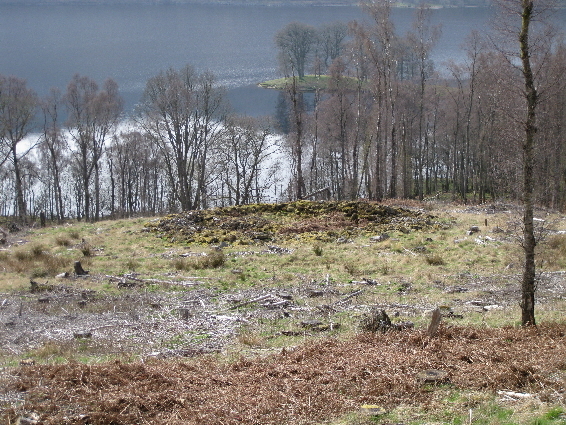 Professor Watson called it Borenich Lower Fort, or Borenich II, and described it as being in a birch wood. During the intervening years the wood has matured and been felled, making access quite difficult, although it is still visible from the main road before the summer bracken obscures it. 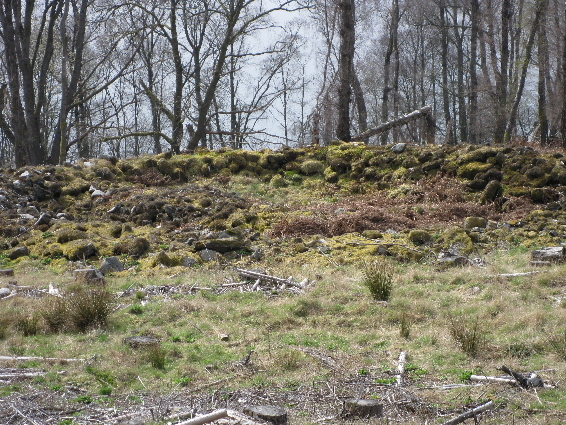 The second fort is less than half a mile east of Borenich farmhouse, in a birch wood on the south side of the public road, about 100 yards from the road, and visible from there. This, again, is a considerable ruin. It also shows about 4 feet of the original inside wall-face on the north for a distance of about 20 feet, and here also the wall is obscured by a great quantity of stones that have fallen inside the fort. The door faced west, and was narrow, a little over 3 feet, as I should judge. The fort seemed to have been not quite circular. Its greatest external diameter is 66 feet, with a wall of from 9 to 10 feet of fairly uniform thickness. Some cairns lie close by, but I saw no external wall. It will be seen that this fort was very similar to its companion fort (Borenich Upper Fort) about three quarters of a mile distant, except that its situation is a good deal lower. This is a much smaller homestead than the one in the Allean Forest. It is roughly circular with an internal diameter of about fifteen metres. 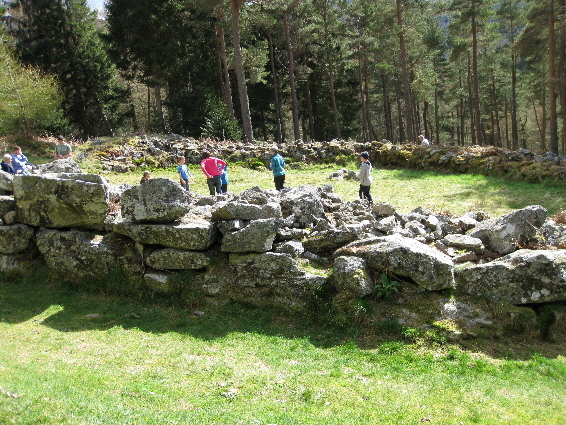 the walls are about three metres wide and are built of small stones on top of a foundation of larger boulders and rocks. There is a large pile of loose rocks at the eastern end, which may have fallen into the homestead. Alternatively the homestead could have been used as a dumping ground for stones being cleared from cultivated land. In the 1700s, flax was being grown in this area and spun into linen at the nearby dwellings of Milltown of Borenich and Tomanbuie. During his excavations, Professor Watson discovered evidence for three separate hearths in the internal area, and uncovered a few finds including part of a rotary quern used for grinding cereal, scraps of iron, a stone spinning whorl and a number of small circular stone discs. No pottery was discovered. The next homestead (NN 8396 6065) stands on the moor about a quarter of a mile north of Borenich farmhouse, and about 300 yards east of the burn which runs by the cultivated fields to the north of the main road. There is an old silver birch growing within it, making it easy to identify at a distance. Professor Watson called it Borenich Upper Fort, or Borenich I. A zig-zagging hill track which starts east of the stream at Borenich farm runs through the moorland, close to the homestead and this is probably the easiest way to reach the homestead. This is quite a large ruin in a comparatively fair state of preservation. A stretch of wall on the north side is still about 4 feet high on the inner face, but is obscured by a large quantity of fallen stones. The doorway faces the west, but its exact breadth is not clear. The outer wall-face is very distinct all round. The fort was nearly circular, with an external diameter of 68 feet, and wall of an almost uniform thickness of 10 feet. 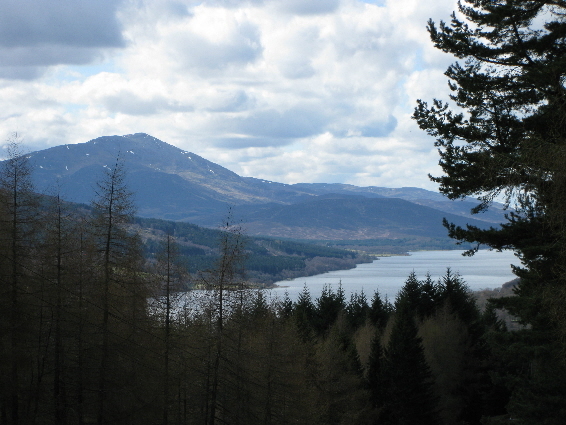 The site gives a fine view of Schiehallion and Loch Tummel, but eastwards the view is cut off by Borenich Rock. The foundation of a wall starts immediately to the south of the doorway (left hand looking west), and runs for about 15 yards, terminating in a stony mound which may or may not have been a stone hut. Another wall starts from a point a little more to the left, runs for about the same length, and terminates similarly. 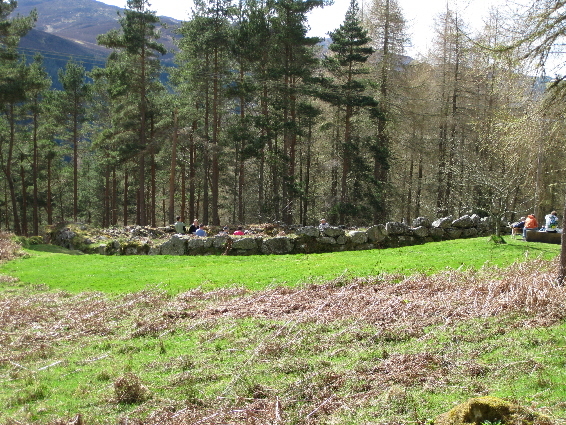 There are several small cairns in the vicinity, and a little to the east is the foundation of an oval hut circle. This structure is about 250 yards south-east of the fort. It is built of stone and earth, measuring about 11 yards by 8 yards. The walls are in some parts about 2 feet high, but in others it is difficult to trace the outline on the ground. The fort, itself, is placed near the mouth of a pass leading to near Baile nan Stiubhartach (Balnansteuartach) in Atholl. Although this homestead is still in much better condition than others nearer to habitation, it is difficult to identify any other features, such as the walls and cairns mentioned by Professor Watson, with any degree of certainty. The ordnance survey map (Sheet NN 86 SW) places a hut circle to the south-east of the homestead (NN 8402 6058), with a cairn to east of these (NN 8411 6060), and a field system in the same area. 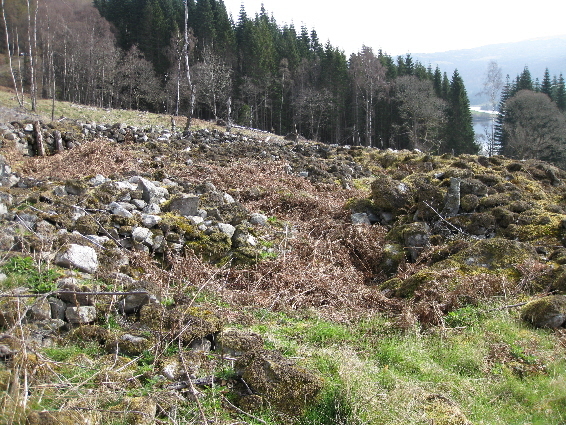 The next homestead is Borenich III (NN 8347 6050) which is described as "in ruins" on ordnance survey sheet NN 86 SW. It is situated in open pasture, about 100 metres to the north of the cart-track between Knockgarry and the ruined limekiln at Uchdnanetaig, but the homestead is not easily visible from the lower ground. The best way to find it is by following the Allt Borenich up from Borenich farm, and continuing up the feeder stream which branches in from the west. After crossing the old track between Knockgarry and Balintochich you ascend a grassy slope, and even then the homestead which is on your left is does not become apparent until you are virtually upon it. Borenich III is approximately the same size as Borenich I and Borenich II, but the stones of the outer ring are few in number and mostly grassed over, making it difficult to see from the lower ground. Neither does it show itself by arial photography. Viewed from the higher ground, the structure is quite obvious for what it is. The centre forms a circular depression, and when standing inside, the outer stones on the north side are exposed to view. The stones on the south side are covered with grass and scrub. The whole structure stands on the flat top formed by a small promentary which slopes steeply to the south. 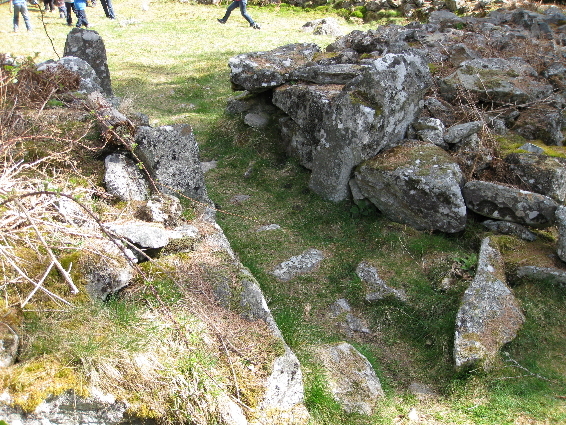 The lack of stones, compared to Borenichs I and II, suggests that this site was used as a cheap source of material for the buildings at Knockgarry and Uchdnanetaig. The fifth homestead is normally associated with Balnabodach, but is actually about 250 metres to the north of Balintuim (NN 8172 6069). Balnabodach Fort stands on a rocky ridge in a cultivated field about 1,100 feet above sea-level, north-west of Balnabodach farmhouse and north-east of Ballintuim farmhouse. It is referred to sometimes as Caisteal Baile nam Bodach and sometimes as Caisteal Baile an Tuim. It commands the whole of the Tummel valley from Loch Rannoch to the eastern part of Loch Tummel. The remains consist only of a grassy bank, with 17 stones appearing on the outer edge of the wall, and 2 on the inner. It is circular, and measures 84 feet in diameter to the outer edge and 67 feet to the inner edge of wall. An intelligent man told me that in his father's time a good deal of the wall was standing. The site is unnoted on the O.S. map. I was told of a 'castle' on the high ground north-east of Balnabodach, and found the place easily. There was, however, no 'castle', but a large cairn rather irregular in shape, but on the whole roundish. It is about half a mile north-east of Balnabodach, on a knoll on the moor called Cnoc na Gaoithe (windy hill). 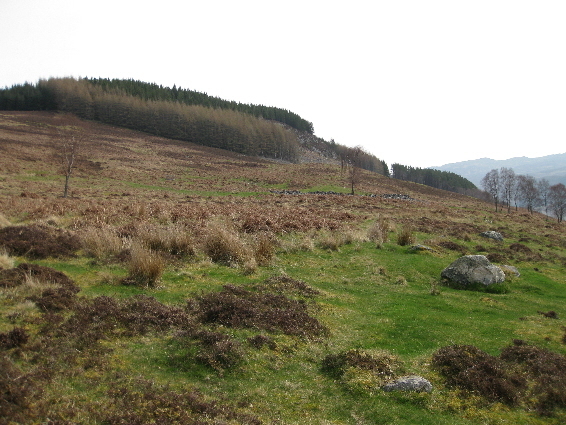 The cairn itself is named An Carn Breac (the spotted cairn). The site is unnoted on the O.S. map. The next homestead is the one at Grennich (NN 8172 6069), which is mentioned by the Rev James McLagan in The Old Statistical Account of Scotland: Blair Atholl and Strowan (1792). Here (i.e. at Grennich) are the remains of a very extensive Druidical work: a large circular wall, either a castle, or the foundation of a very large cairn, with small cairns innumerable on the barren ground above it, which were probably graves. About a mile to the northward of these is a large cairn that appears only to have been begun, the circumference being, laid of great stones and a parcel of lesser ones thrown within it. Watson described the homestead in the following terms. Grennich Fort is situated about a mile west of the last, in a cultivated field about 300 yards north-east of Grennich farmhouse, and about 1000 feet above sea-level. The fort is in a dilapidated condition, as most of the large stones have been removed, and the enclosure itself has been made a dumping-ground for small stones gathered from off the adjacent fields. Its greatest diameter is about 95 feet. What appears to be an old dyke runs in to its eastern side. About 30 feet to the east are the remains of a small structure which may have been connected. Today, nearly 100 years later, there is virtually nothing to be seen of this homestead except a slightly raised, grassy, mound in the corner of a field behind Grennich farm. 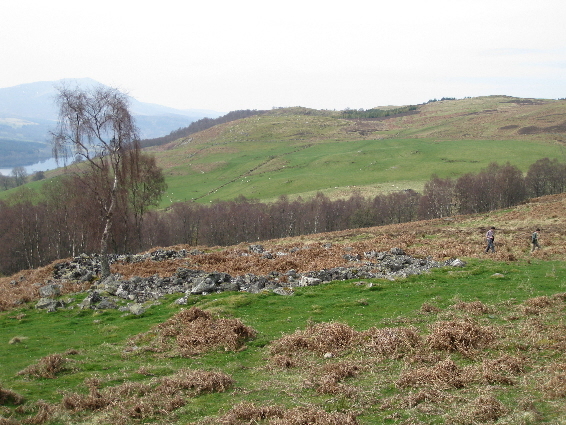 Perhaps the stones are beneath the grass which covers the site, but more likely, the larger stones have been removed to construct a drystane dyke to the west, which separates the agricultural land from a conifer plantation.